The number of genera Japnese Lauxaniidae increased more than two times after the year published Catalogue of Japanese wildlife. I have not ever seen any revisions of this family about Japanese species still now, although some species or genera are replaced other taxon. So I tried to make it in order to my mind. 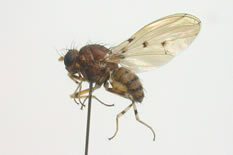 I’m getting ready for publication as following descriptions on a paper “Hana Abu”, Dipterist’s Club of Japan. But now, it is possible there are some mistakes. So, I recommend for using this article as your personal, not for academic. And I expect you will send some information or opinions in order to make a better one.In this connection, I took the classification from Shatalkin (2000). Blk letter：The genera Japanese Lauxaniidae entered on Catalogue of Japanese wildlife(Invertebrate II) published by Department of Emvironment (1995). Red letter：Suppliment genera of Japanese Lauxaniidae refered about their distributions by Papp & Shatalkin(1998), Shatalkin(2000) and Tamaki(1997) after the Catalogue published. Eight genus as follow are recorded by our researches still now. 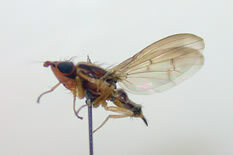 Two species of this genus are in Japan. 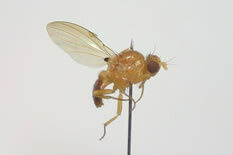 One of them, L. (Tetroxyrhina) forficula is found out in Tohoku district in our researches. 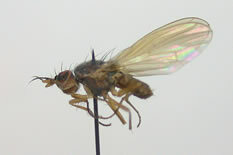 The species of this genus is very similler to gen.Trigonometopus. But their tip of 3rd Antenna is not pointed like latter species. 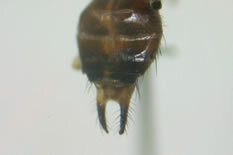 And male genitalia of subgen. Tetroxyrhina is remarkable as left image. 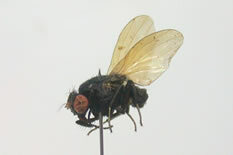 Only P. maculifrons is found out in Tohoku district by our researches. 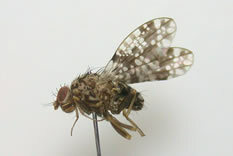 Characteristics of P. maculifrons are as follows, arista thick by having short hair, One pair of black spot in middle face as left image. 本邦産はPapp (1984) がロシア沿海州で採集された標本を元にLyciella (Shatalkinia) supraorientalisとして記載した種S. (Sh.) supraorientalisのみが知られる. 3 species are recorded in Japan. Moreover some undiscribed species are recognaized. Steganopsis sp.1 reported in Tamaki (1997) is found out in Tohoku district. Only T. frontalis is known from Japan. It is a characteristic to have sharp pointed 3rd antenna. 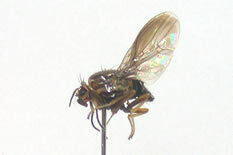 This species is captured often in wetland. 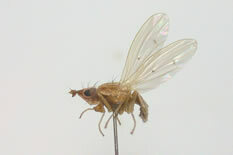 And the shape of its face is similar to some species of Sciomyzid flies. 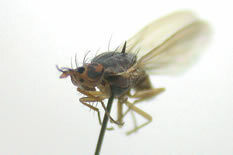 Shewell, G. E.(1987) Manual of Nearctic Diptera Vol.2, Research Branch Agriculture Canada, Monograph No.28, P.951-964. 玉木長寿 (1997) 最近，日本から発見された興味あるシマバエ科，7種．HANA ABU No.4, P.1-16. copyright ©1995-2019 Ecoris Inc, All Rights Reserved.